Search is among the most disruptive innovations of our time. It influences what we buy and where we go. It shapes how we learn and what we believe. In this provocative and inspiring book, you'll explore design patterns that apply across the categories of web, ecommerce, enterprise, desktop, mobile, social, and real-time search and discovery. 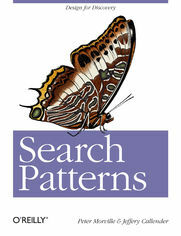 Filled with colorful illustrations and examples, Search Patterns brings modern information retrieval to life, covering such diverse topics as relevance, faceted navigation, multi-touch, personalization, visualization, multi-sensory search, and augmented reality. By drawing on their own experience-as well as best practices and evidence-based research-the authors not only offer a practical guide to help you build effective search applications, they also challenge you to imagine the future of discovery. You'll find Search Patterns intriguing and invaluable, whether you're a web practitioner, mobile designer, search entrepreneur, or just interested in the topic.